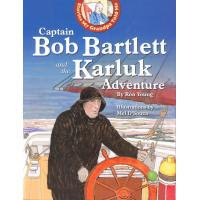 In Captain Bob Bartlett and the Karluk Adventure, written by Ron Young and illustrated by Mel D'Souza, rhyming couplets tell the true story of Ship captain Bob Bartlett and a time in 1913 when his ship was stuck in the ice for many months. The crew and passengers actually had to set up camp on the ice until they could walk to an island. It is a great adventure story for elementary age children. This story was a little above Anna at this point in time and she struggled to stay focused on it, but at them same time she really wanted to hear the story. I definitely see us coming back to this one in a couple of years time as part of our social studies. To be totally honest, I am not sure if Ron Young is a Newfoundlander or not, but I am assuming he is because all the books that I can find written by him have a Newfoundland theme. llustrator Mel D'Souza is a writer/cartoonist for Downhomer Magazine and has illustrated several children's books. Born in East Africa, he immigrated to Canada in 1971. He lives in Ontario but has a summer home in Newfoundland. It sounds to me like he is an honorary Newfoundlander, even if he isn't a full fledged one.